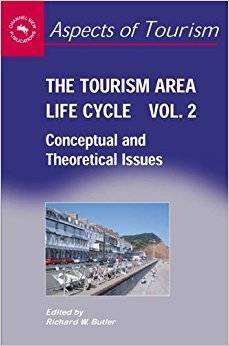 Richard Butler, "The Tourism Area Life Cycle, Vol. 2: Conceptual and Theoretical Issues"
This volume consists of specially invited chapters by leading researchers who have reviewed the original model in the light of their own and other conceptual and theoretical positions and models. The book is divided into five sections, the conceptual origins of the TALC, spatial relationships and the TALC, alternative conceptual approaches, renewing or retiring with the TALC, and predicting with the TALC. The book concludes with a review of the future potential of the model in the area of the destination development process.